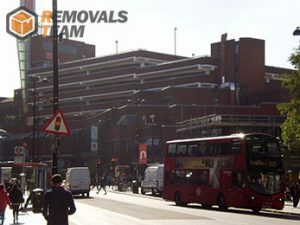 Removals Team London is your leading professional moving company for North London. It does not matter what your exact needs and the individual specs of the relocation job in N, NW postal areas of the capital that you want to hire us for are, we will meet everything with the due diligence, professionalism and care for the detail. They will take up the job you have prepared for them, tailor an individual plan for it and then complete every step with unmatched skill and motivation. Nothing makes us happier than the outstanding customer reviews that we are constantly receiving and we can assure you we work very hard for them. We can easily load and unload large volumes of items due to the fact that we have invested into a large range of top quality lifting instruments. Our hand trucks, furniture dollies, forearm forklifts, shoulder straps and floor dollies, allow us to pick up and load, easily and efficiently even the bulkiest and heaviest objects. It many ways, it is because of our technical capacity that we have earned for ourselves the sterling reputation of the movers to call when it comes to complex and large-scale property removals in North London, NW. Our prices are affordable because we form them with the aid of a specialised moving cost calculator. This way, we can take into account the exclusive parameters of every domestic or commercial relocation and draft custom-rates that fit perfectly into the moving budgets of our clients. You can see in advance how much our removal services in North London, N, will cost you by giving us a call and requesting a final and personalised quote. Forget about the stress and strain of your upcoming domestic removals in the area of North London. We will help you relocate your family and your possessions in a manner that is truly pleasant. The years of experience we have accumulated working in the field of house moving throughout London has thought us everything we have to known in order to guarantee strain-free relocations for our clients. Removals Team London is also a dedicated and fully certified provider of office moving services for the northern parts of the capital. If you want the best for your business in this very important time of transition, make sure to check out our offers. Our North London storage facilities would fit your needs exactly. Our units come in various sizes on short-lease and long-term lease. They are fully secured and would not cost you that much to store your goods with us. You can easily book our North London, NW, removal company as we work with a flexible schedule that always has free slots. Furthermore, our agenda allows us to accept last minute jobs, so you should feel free to get in touch with us on a short notice. Also, do not be hesitant to request us to handle your move after traditional work hours because we do carry out late night operations. Feel free to get in touch with our very helpful customer support for further details concerning our high quality North London covering removal services, as well as for booking and a free no obligation quote. We can be reached around the clock over the phone and via the easy to use online contact form on our website. North London is a place name that designates those areas of the English capital that occupy the territories to the North of the River Thames, including some of the most iconic territories of London – The City and Westminster. North London is generally considered to be the better place to live and work, simply because it is older and transport links, residential infrastructure and the likes are much better developed. Crime rates here are also generally lower. The northernmost parts of the capital are occupied by the Metropolitan Greenbelt. Statistically speaking, North London contains more Nature Reserves than the rest of the present day London metropolitan area. The sub-area of North London is arguably the most visited and famous part of the United Kingdom. It is like this because it is the location of numerous world famous landmarks such as Buckingham Palace, Westminster Abbey, Elizabeth Tower, Palace of Westminster, Queen’s Theatre, Gidea Park, The Diver and many more. It is also home to some of the finest residential districts in the British capital. Bear in mind that we have the necessary tools to carry out specialised removals in North London which involve the moving of bulky, heavy or delicate items such as artwork, construction materials, manufacturing machinery, office equipment, musical instruments including pianos, antiques, glassware and other types of breakables. You can learn more about our heavy duty relocation services by contacting your friendly and courteous customer consultants. All removals projects for which we are hired are carried out with the aid of our new and fully stocked vans and trucks. We have a large armada of vehicles which we maintain in mint condition and which we have fitted with the most modern satellite navigational systems. The cargo sections of our Lutons and Lorries are equipped with transportation belts which prevent transit accidents by preventing the hauled items from moving and bumping into one another. Know that we from Team Removals London also rent out our vehicles against cost effective rates. Our prices are fair and reasonable and we promise you that they will fit into your moving budget. We are reputed to provide the most affordable North London removal services because we don’t work with fixed rates. Instead we form individual fees which are based on the parameters of each relocation for which we are employed. It is because of our flexible pricing technique that we have the best quality/price ratio in the area. North London is home to some of the most opulent districts of the English capital. It is also the location of numerous world famous landmarks such as the Victoria and Albert Museum which is currently the 6th most visited venue of its kind in the United Kingdom. The area has strong ties with football as it is home to three of England’s most prominent football clubs, Arsenal F.C, Chelsea F.C and Tottenham Hotspurs.